Windows Mobile, Palm OS, Linux, and Symbian currently power the world’s smartphones. How does each stack up against Apple’s OS X in the iPhone? This article presents an overview and lineage of Symbian. Like the Palm OS and Microsoft's WinCE, Symbian also originated out of a software platform designed for PDAs. However, Symbian has been in development specifically for use in mobile phone devices since 1998; work to adapt the Palm OS and WinCE for use in mobile phones didn't get really going until around 2002, and was largely bolted on the side of platforms that were already of dubious value. Symbian was formed in a partnership between British PDA maker Psion and some the world's largest mobile manufacturers, including Nokia and Ericsson. Symbian's software origins at Psion help to explain why the system is regarded as stable and sophisticated. Psion got started in the early 80s writing software for the mini home computers built by Sinclair Research. Sold under the name Timex Sinclair in the US, the ultra cheap systems were wildly popular because they offered the idea of a home computer for less than $100. In 1982, 500,000 Timex Sinclair 1000 devices were sold in its first 6 months on the US market, surpassing the combined sales of Apple, Tandy, and Commodore. Psion got into the hardware business in the mid 80s selling the Organiser and Organiser II, a set of programable calculators with a multiple line text display. For its third generation of handheld organizers, Psion began work on an entirely new, sophisticated 16-bit platform called SIBO, the SIxteen Bit Organizer. SIBO devices had a full keyboard and a graphic display using icons and a windowing environment. Resembling an updated version of the Timex Sinclair mini PCs, the tiny handhelds are considered the first practical PDA. The Psion 3 appeared in 1991, a couple years prior to Apple's Newton and a half decade before Microsoft's first WinCE powered Handheld PCs arrived in 1996. The Psion 3 organizer was also sold by Acorn Computer under the name Acorn Pocket Book. Acorn was the British equivalent of Apple. In the late 70s, Acorn got started selling a line of 6502 based computers similar to Apple's. It subsequently won a computer literacy contract sponsored by the BBC, resulting in the 1981 BBC Micro, a peer of the Apple II, which established Acorn in the UK home and education market. In its search to find a processor to power its next generation graphical system, Acorn rejected both the Mac's 68000 and the 65C816--a 16-bit version of the 6502--used in the Apple IIGS, because neither could support the Tube architecture it had developed to enhance the BBC Micro. Inspired by the Berkeley RISC project, Acorn decided to start work on its own custom processor in 1983, called ARM: the Acorn RISC Machine. Acorn partnered with VLSI Technology to build the new 32-bit RISC processors, which used a highly simplified design borrowing some aspects from the 6502. By mid 1987, Acorn shipped Archimedes, its first computer based on the new ARM processor. Throughout the late 80s, the BBC installed Archimedes computers in schools through the UK, Ireland, and Australia. Archimedes shared similarities with the Macintosh, Amiga, and Atari ST, although its RISC processor was faster and more modern than the Motorola 68000. It ran Acorn's RISC OS, which like Apple's Mac System 7, was a graphical, single user, single-threaded system with cooperative multitasking and minimal memory protection. In 1987 Apple started work with AT&T on the experimental Hobbit processor for use in the Newton project run by Steve Sakoman. At that point, Newton was conceived as a high-power tablet version of the Mac. After Sakoman left Apple with Jean-Louis Gassée in 1990 to form Be, Inc., the Newton project was reevaluated. Sakoman's Newton design called for three Hobbit processors to enable it to perform handwritten recognition, making it prohibitively expensive. Apple began looking at Acorn's new ARM processor, which offered more speed than the 68000 in a much smaller, more energy efficient package. In 1990 Apple created a partnership with Acorn and VLSI that was spun off as an independent company called Advanced RISC Machines. 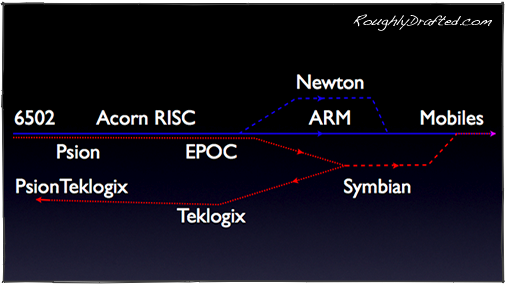 The new partnership released a third generation of ARM processors, called ARM6, which was used both in Apple's 1994 Newton as well as Acorn's 1994 RISC PC, the successor to its Archimedes line. While working with Apple on ARM, Acorn's parallel partnership with Psion expanded in its next generation of organizers, when Psion adopted the ARM processor in its Series 5 in 1997. Like Palm, Psion skipped a fourth generation name because the word "four" is superstitiously related to death in China, Japan, and Korea, prime markets for the gadgets. The Series 5 incorporated a 640x200 touch screen display and a full mini keyboard into a pocket sized form factor, making it closer to Microsoft’s plans for the WinCE Handheld PC than the Palm Pilot or Newton. Even so, the Series 5 was years ahead of Microsoft's WinCE, which was going nowhere until it licensed the remains of Apple's Magic Cap spin off in 1998. Psion developed an entirely new operating system for the Series 5's 32-bit ARM processor called EPOC32. It featured preemptive multitasking and memory protection, and was designed to accommodate third party licensees by making it easy to develop custom graphical interfaces based on a core set of GUI classes. In mid 1998, Psion's software unit was spun off into the Symbian partnership with investment from Ericsson, Nokia, Panasonic, and Motorola. EPOC32 became known as the Symbian OS. Like Palm, Psion followed the advice directed at Apple, to spin off its software technology as a separate company and work with hardware partners. That was Microsoft's strategy with WinCE, and even Apple had attempted to license the Newton OS and hardware designs to other companies. However, after licensing out its advanced OS though the Symbian partnership, Psion found itself in a similar position to Apple during its Mac clone experiment: Psion's own hardware sales were cannibalized by Symbian products from its partners, particularly Nokia. Psion also invested heavily in work with Symbian partner Motorola to develop wireless communication devices under the name Odin. However, in 2001 Motorola backed out of the project, and then cashed out of the Symbian partnership entirely in 2003. That abandonment destroyed the remains of Psion's hardware operations, leaving just its business services division remaining. It then partnered with Teklogix, a WinCE-aligned group, and sold off its remaining Symbian shares in 2004 to Nokia, Panasonic, Siemens AG, and Sony Ericsson. While the parent companies of Acorn and Psion faded into obscurity, both ARM and Symbian rapidly gained stature in the embedded and mobile markets. Around 75% of the world's 32-bit embedded devices use ARM processors, and a similar majority of smartphones run Symbian. After dropping the Newton in 1998, Apple returned to using ARM processors in the iPod in 2001. Most iPods have two ARM processors, both running at a relatively low 90 MHz speed to conserve power. That is still far faster than the 20 MHz chip powering the original Newton MessagePad, however. 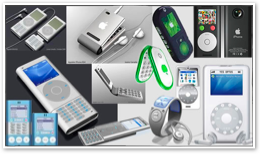 Modern PDAs and MP3 devices, including the Palm Tungsten and Treo, newer BlackBerry models, Microsoft's Zune, PlaysForSure players, and Pocket PC PDAs, all use much faster versions of ARM processors. They have to have speedy ARM processors because they're running custom, inefficient software: either the sub-optimal Palm OS Garnet, the sluggishly thick WinCE, or RIM's custom OS. Apart from vendors dependent upon Palm or Microsoft, most smartphone mobile makers run either Symbian or Linux. Linux has advantages in running a more complex Internet device, but the top mobile makers have invested extensive development into Symbian. The resulting stability of the OS, paired with an easy to customize interface, makes Symbian a quick and easy choice for mobile phone development. Symbian recently announced that 100 million smartphones have shipped with the Symbian OS. So why didn't Apple pick Symbian for the ARM based iPhone? Last year, An iPhone Worth Talking About suggested that Apple would likely use Symbian, but that also assumed that Apple's smartphone would be a rather simple phone, not a full computer and video iPod media device. Companies outside of Apple building a device like the iPhone would not be likely to use Symbian either. Even Nokia, the largest maker of mobile phones and a primary shareholder in Symbian, bases its own Internet Tablet products, the 770 and N800, on GNU/Linux. That's because, while the Symbian OS provides a good foundation for a smartphone, it does not offer much in a general computing device. Further, any company interested in investing significant, long term development efforts into a code base will likely not want to be tied to the whims of external developers managing a commercial, proprietary product. In that regard, Symbian is no more attractive than Microsoft's WinCE. Licensees who simply want to crank out a phone product with a customized veneer benefit from the work already done in Symbian. Sony’s partnership with Ericsson bought into the Symbian OS partly because Ericsson is a major investor in Symbian, and partly because Sony in content selling other company's software on its own hardware. Sony also licensed the Palm OS for its Clié PDAs, and Windows XP for its VAIO PCs. Neither of those products are very good, because while Sony created impressively engineered hardware, the included software was marginal and poorly integrated. Sony Ericsson's Symbian phones demonstrate the same problem: good bits of hardware and good bits of software can be slapped together into an unimpressive product that doesn't really work well. Although it continues to make some Symbian phones, Motorola pulled out of the Symbian partnership. Motorola also dabbles in making WinCE phones, but its real focus is in Linux, particular in the Chinese market, where open source is preferred to proprietary Western technology like Symbian or Microsoft's WinCE. 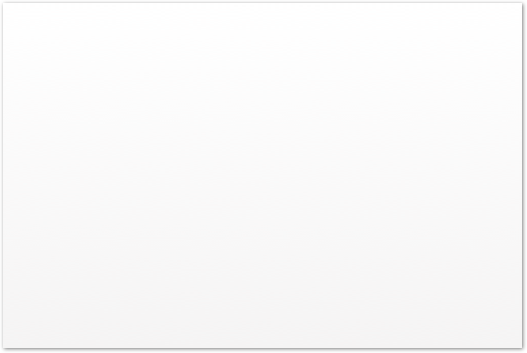 From that perspective, it's no surprise why Apple didn't use Symbian. Unlike earlier iPods, the iPhone is a full software platform demanding support for applications Symbian does not address. Further, Apple needed a lot of control to provide the level of integration it planned to deliver. The iPhone isn't a smartphone as much as it is a handheld computer with specialized mobile and media applications. Apple already has a platform suitable for a full computing environment. Everyone else has Linux. How does Apple’s OS X compare to Linux in sophisticated mobile devices? The next article will take a look.